Midtown Square offers spacious one and two bedroom apartment homes, including some direct access units in a sophisticated and modern setting with amazing amenities and breathtaking views. Your new home will feature quartz kitchen countertops, stainless steel appliances, in-unit washer/dryer, breakfast bar and large walk-in closets. From the front door to the bedroom, each of our homes gives you up to 1,331 square feet of optimized living space and takes Glenview apartment living to the next level. Check out our community photo gallery to get an exclusive sneak peek of our elegant home interiors. Our amazing features and thoughtful designs don't end with your home. Residents of Midtown Square will also enjoy a covered/heated garage parking, on-site retail, a business center, club room, Wi-Fi coffee lounge, bike storage, and 24 hour fitness center! Unwind in our resident wine room or play a game of billiards on our community pool table. Other conveniences include storage lockers, a conference room, an elevator, and secure bicycle storage. Our community is pet friendly, and offers a dog washing station as well. Be sure to view our pet policy to learn more! 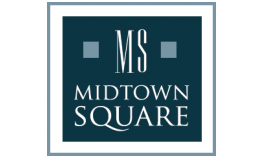 Midtown Square provides easy access to shopping, dining, and entertainment in the area. From on-site retail to downtown Glenview, you won't miss a chance to enjoy local shops and fine dining just minutes from home. our community is also surrounded by golfing, camping, and local parks on every side. Our proximity to Interstate 294 means easy travel and stress free commuting. We are located within walking distance to the Glenview Metra train station that will take you to downtown Chicago in less than 30 minutes. Choose Midtown Square Apartments today to experience luxury living at its best! Schedule a community tour with one of our friendly office staff today or go online and apply now to begin making Midtown Square your new home!